Church Slavonic or New Church Slavonic is the conservative Slavic liturgical language used by the Orthodox Church in Bulgaria, Poland, the Czech Republic and Slovakia, Russia, Serbia, Montenegro, Bosnia and Herzegovina, Republic of Macedonia and Ukraine. The language also occasionally appears in the services of the Orthodox Church in America. It was also used by the Orthodox Churches in Romanian lands until the late 17th and early 18th centuries, as well as by Roman Catholic Croatians in the early Middle Ages. In addition, Church Slavonic is used by some churches which consider themselves Orthodox but are not in communion with the Orthodox Church, such as the Macedonian Orthodox Church, the Montenegrin Orthodox Church, the Russian True Orthodox Church and others. It is also sometimes used by Greek Catholic Churches, which are under Roman communion, in Slavic countries, for example the Croatian and Ruthenian Greek Catholics, as well as by the Roman Catholic Church (Croatian and Czech recensions, see below). Church Slavonic represents a later stage of Old Church Slavonic, and is the continuation of the liturgical tradition introduced by the Thessalonian brothers Cyril and Methodius in the late 9th century in Nitra, a principal town and religious and scholarly center of Great Moravia (located in present-day Slovakia), who produced the first Slavic translations of the Scripture and liturgy from Ancient Greek. By the early 12th century, individual Slavic languages started to emerge, and the liturgical language was modified in pronunciation, grammar, vocabulary and orthography according to the local vernacular usage. These modified varieties or recensions eventually stabilized and their regularized forms were used by the scribes to produce new translations of liturgical material from Ancient Greek, or Latin in case of Croatian Church Slavonic. Attestation of Church Slavonic traditions appear in Early Cyrillic and Glagolitic script. 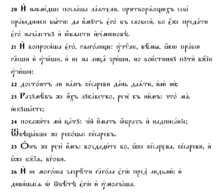 Glagolitic has nowadays fallen out of use, though both scripts were used from the earliest attested period. The first Church Slavonic printed book was the Missale Romanum Glagolitice (1483) in angular Glagolitic, followed shortly by five Cyrillic liturgical books printed in Kraków in 1491. Church Slavonic language (also known as New Church Slavonic, the name proposed by F. V. Mareš) is actually a set of at least four different dialects (recensions), with essential distinctions between them in dictionary, spelling (even in writing systems), phonetics etc. The most widespread recension, Russian, has, in turn, several local sub-dialects with slightly different pronunciations. The letter Γ can traditionally be read as voiced fricative velar sound [ɣ] (just as in Southern Russian dialects); however, occlusive [ɡ] (as in standard Russian pronunciation) is also possible and legal since the 20th century. When unvoiced, it becomes [x]; this has influenced the Russian pronunciation of Бог (Bog) as Boh [box]. The adjective endings -аго/-его/-ого/-яго are pronounced as written ([aɡo], [ʲeɡo], [oɡo], [ʲaɡo]), whereas Russian -его/-ого are pronounced with [v] instead of [ɡ] (and with the reduction of unstressed vowels). Miscellaneous other modernisations of classical formulae have taken place from time to time. 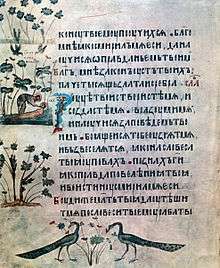 For example, the opening of the Gospel of John, by tradition the first words written down by Saints Cyril and Methodius, искони бѣаше слово "In the beginning was the Word", were set as искони бѣ слово in the Ostrog Bible of Ivan Fedorov (1580/1581) and as въ началѣ бѣ слово in the Elizabethan Bible of 1751, still in use in the Russian Orthodox Church. ↑ Hammarström, Harald; Forkel, Robert; Haspelmath, Martin; Bank, Sebastian, eds. (2016). "Church Slavic". Glottolog 2.7. Jena: Max Planck Institute for the Science of Human History. ↑ See Brian P. Bennett, Religion and Language in Post-Soviet Russia (New York: Routledge, 2011). ↑ See the report of Fr. Theodore Lyudogovsky and Deacon Maxim Plyakin, Liturgical languages of Slavic local churches: a current situation, 2009 (in Russian), and a draft of the article Liturgical languages in Slavia Orthodoxa, 2009 (also in Russian) of the same authors. ↑ "Rimski misal slavĕnskim jezikom". Kršćanska sadašnjost. Retrieved 2012-10-16. ↑ "Review (in Croatian) of Rimskyj misal (Olomouc, 1972)". Slovo. Retrieved 2012-06-04. ↑ "Review (in Croatian) of Rimskyj misal (Olomouc, 1992)". Slovo. Retrieved 2012-06-04. Herbermann, Charles, ed. (1913). "Slavonic Language and Liturgy". Catholic Encyclopedia. New York: Robert Appleton Company.